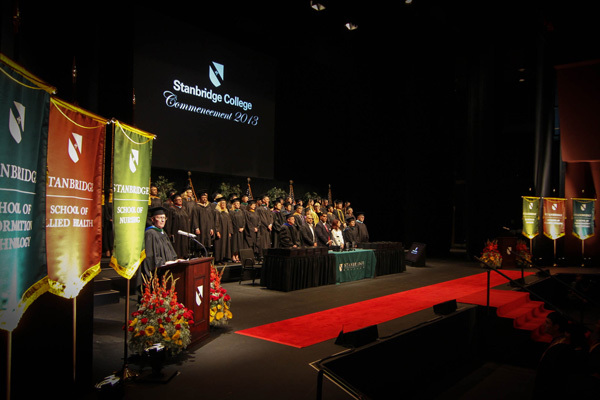 Stanbridge College, a technical college that offers Masters, Bachelor, and Associate of Science degrees and diploma programs in Allied Health and Information Technology, featured Kyle Maynard, award-winning athlete, motivational speaker, author, and entrepreneur, as the keynote address to over 2,900 guests at the 2013 Commencement Exercises at Segerstrom Hall. Mr. Maynard was born with a condition known as congenital amputation that has left him with arms that end at the elbows and legs that end near his knees. With a lifetime of overcoming adversity, Mr. Maynard addressed the graduates and challenged them to find their purpose in life as they move to the next stage of their professional careers. Despite his disability, Kyle Maynard grew up like most normal boys, with a keen interest in sports like football and wrestling. As he grew up, Mr. Maynard became an award winning wrestler, weight lifter, and Mixed Martial Arts fighter with a focus in Brazilian Jiu-Jitsu. During his address, Mr. Maynard talked about overcoming challenges ranging from the mundane, texting on the iPhone, to the extraordinary, summiting Mount Kilimanjaro in Africa in 2012. Throughout it all, Mr. Maynard emphasized the importance of having a ‘why’ as a driving factor. 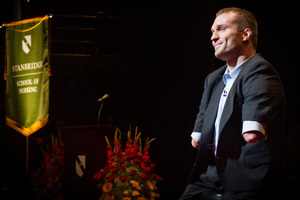 Kyle Maynard is a two-time ESPY Award Winner for Best Male Athlete with a Disability (2004 and 2012), recipient of the 2004 Presidents Award for the Sports Humanitarian Hall of Fame, and an inductee into the National Wrestling Hall of Fame with the Medal of Courage. Mr. Maynard’s most recent goal, which earned him his second ESPY award, was to reach the summit of Mount Kilimanjaro, the tallest mountain in Africa. 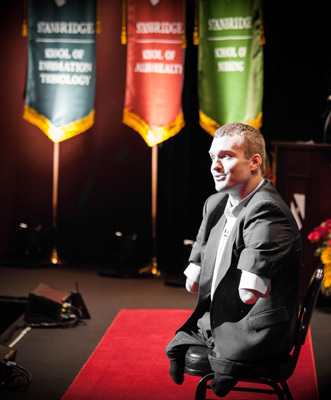 During the address at Segerstrom Hall, Mr. Maynard described his journey in 2012 where he and a team of several wounded veterans reached the peak of Mount Kilimanjaro becoming the first quadruple amputee to get to the top without assistance. Stanbridge College hosted its 2013 Commencement Exercises awarding diplomas and degrees to its Vocational Nurse, Occupational Therapy Assistant (OTA), Hemodialysis Technician, Bachelor of Science in Nursing, and Information Technology graduates. The ceremony also featured a guest speaker address from Salim Ismail, Global Ambassador and Founding Executive Director of Singularity University. The ceremony marked the inaugural class of the OTA, RN to BSN Degree Completion and Hemodialysis Technician programs at the college. Stanbridge College offers a variety of healthcare degree and diploma programs that prepare them to sit for professional licensure exams. Currently, the Irvine based college maintains one of the highest continuous pass rates in California on the NCLEX-PN nursing exam with a 93% six year average pass rate. With over 950 students, Stanbridge College also offers Master of Science in Nursing, Master of Science in IT, and Physical Therapist Assistant degree programs. To learn more about the Allied Health and IT degree programs at Stanbridge College and its community service activities, please visit www.stanbridge.edu.